Home Featured Blog Welcome to Our New Website! 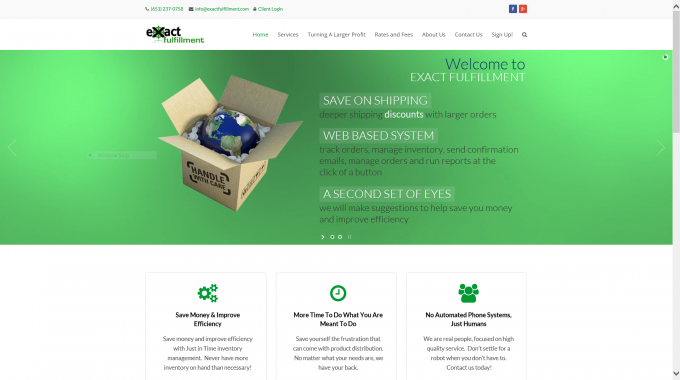 Welcome to the New ExactFulfillment.com! Thank you for visiting ExactFulfillment.com! We have recently launched our new website with the goal of providing our customers with all the information they need in the most visually friendly way possible! Exact Fulfillment’s new website is responsive. This means you will be able to enjoy easily navigating through pages, news articles, online forms, and our services right on your cell phone. Be sure to check the Industry News section for upcoming events, recent news in the fulfillment industry, and special promotions from Exact Fulfillment. If you notice that something is not operating the way you feel it should, we encourage you to share that info with us so we can get it all sorted out. We encourage you to leave your name and email so we can keep you updated on all the latest news, promotions, and services! Just fill out the form in the sidebar or in the footer and we will make sure you are included on the next news update!